A Himalayan hermit who, with his penance, imbued Swami Chinmayananda with faith in the scriptures and fire for the Truth. Swami Tapovanam was a saint of the highest order, a consummate Vedantin, strict teacher, a compassionate mentor, and a poet whose every thought throbbed with ecstatic awareness, and a sage of unsurpassed wisdom and tranquillity. 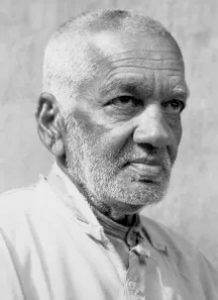 Born in 1889 in Kerala, India, Chippu Kutty, as Swami Tapovanam was known, exhibited a marked partiality for spiritual life. As a child, he was fascinated and delighted by Pauranik stories manifesting the glories of God and the worship of idols fashioned by his own hands. Too intelligent to be trained within the formal learning systems of his time, he sought a less materialistic and more of spiritual education. Home-schooled until the age of 17, he proved himself to be a devout Vedantin, and a linguistic genius and litterateur par excellence, mastering both Malayalam and Sanskrit. Both his parents passed away before he turned 21, and by then, he was already renowned and revered for his original poetic compositions. He adopted the sannyasi’s religious and serene lifestyle long before his initiation into the ochre robe of sannyasa. An introvert to the core, he loved spending his time immersed in spiritual reflection and was averse to all worldly pleasures. Even as a formidable scholar, his thirst for knowledge could not be quenched by mere intellectual advances. Despite the accolades earned during his years of public speaking on literature, politics, religion, and Vedanta, in his late 20s, unable to control his spiritual hunger, Chippu Kutty left home in search of Truth. For seven years he traveled widely, devoutly studying Vedic scriptures and observing austerities. Swami Janardhana Giri of Kailash Ashram in Rishikesh initiated him into sannyasa with the name, Swami Tapovanam – “forest of austerities”. Swami Tapovanam chose to live in the then small, remote mountainous area of Uttarkashi in Uttaranchal. His hermitage called Tapovan Kutir, a meager one-room thatched hut, in front of which the sacred River Ganga flows would soon acquire great fame the world over for its spiritual luminescence. Filled with divine Light, the compassionate sage shared words of wisdom with all devotees who came to him in search of spiritual knowledge, but rarely did he accept resident disciples. Monks, householders, pilgrims, and seekers from all stages and fields of life continually thronged to Uttarkashi to be in the presence of, and learn from, the Self-realized master and erudite scholar. When Swami Tapovanam did accept a resident disciple, the latter was trained under the strictest conditions. There were few who could undergo and survive such hardships, but those seekers who did were blessed by the Master with supreme Enlightenment. As a jivanmukta or Self-realized master, Swami Tapovanam was a lover of Nature and saw the supreme Lord in all expressions, within and without. In his inspiring, poetic works of Himagiri Viharam (Wanderings in the Himalayas) and Kailasa Yatra (Pilgrimage to Kailasa) are seen the full flow of his blissful and soulful renderings of Nature, and the profundity of his subtle observations and reflections. However, it is his mystical autobiography, Ishwara Darshan (Vision of the Lord), that sages and seekers the world over have stamped as his masterpiece.